Posted by Steve on May 29, 2013 . Leave a comment. Hope you can help me out. I own a thoroughbred racehorse, and want to know that he is being properly shod. I read parts 1,2 and 3 of Hoof Angles, but I’m still not sure how I should proceed to make sure my horse is properly shod. Do I need to measure before I give instructions to my farrier? If so, what should I measure? Then what instructions do I need to convey to the farrier? I guess I’m a little confused, because other reading I’ve done gave straightforward instructions, but after reading your Hoof Angles I’m not so sure about what they said. I hope you can unconfuse me. I’ll try, but there are no guarantees because it’s a subject fraught with misinformation and confusion! 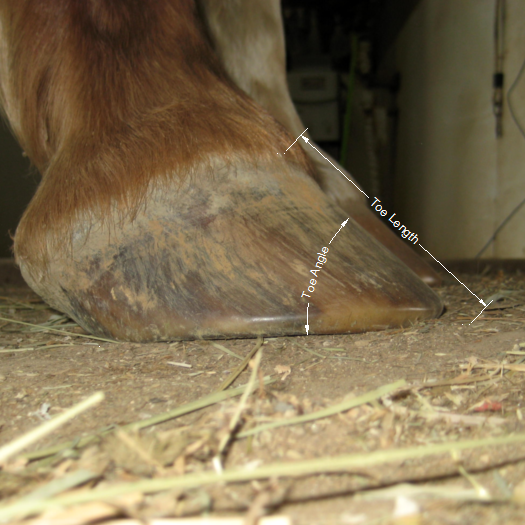 There are a lot of folks out there who attempt to quantify the “correctness” of hoof trimming or shoeing using particular measurements – most often toe angle, and occasionally, toe length. That’s understandable, because many texts and training programs teach hoof care professionals to trim “to the numbers” instead of imparting a clear understanding of proper hoof form (which, I believe, most people lack). Unfortunately, trimming a horse to a specific toe angle and/or length is not in the horse’s best interest, because: 1) horses vary widely in terms of what constitutes an optimal hoof length and angle, and 2) horses vary widely in their sensitivity to deviations from that optimal length and angle. For example, one horse may have an optimal hoof angle of 53 degrees and length of 3-3/8 inches, while another may have an optimal hoof angle of 48 degrees and length of 3-7/8 inches. But although either or both of those horses may appear to do fine (at least in the short term) with, say, a hoof angle of 50 degrees and length of 3-1/2 inches, it’s just as likely that one or both will be lame with that much deviation from optimal. And that’s the problem: we can’t predict which ones will and which ones won’t. We can only see the extent of the effects of less-than-optimal trimming after the damage has already occurred – often quite far into the future. Number 2 above is also the reason many horses give every appearance of doing fine in spite of their hooves being grossly out of balance; for whatever reason, they’re not particularly sensitive to angle and length variations. That makes it difficult for people to see and understand the short- and long-term advantages of proper hoof care. I’ll often look at a horse with significant chronic imbalances, evidenced by deviations from straight hoof capsule growth such as flare, thickening, and bent horn tubules, and hear “My horse has been trimmed/shod by the same guy for the last 10 years, and he goes just fine!” Of course, those same people will often be the ones whose horses eventually start experiencing a shortened stride, heel pain, or “mysterious” lamenesses. In the short term, it’s often a matter of being in a position to appreciate the distinction between “just fine” and “optimal.” And if you’ve only experienced “just fine,” how would you even know there was something better? The woman who always runs races wearing her high heels, for example, would never deny that it’s possible to run in them. But if she were to exchange them for flat shoes, she’d quickly discover that the flat shoes allow her to run much more efficiently. Perhaps more importantly, if she were able to look into the future, she’d also see that the high heels were actually causing long-term damage to the tendons in her feet in the form of premature arthritis. As with this woman in her high heels, this distinction is lost on most horse people because the horse isn’t immediately lame in the vast majority of cases. And this situation is very similar to several others we’re familiar with. 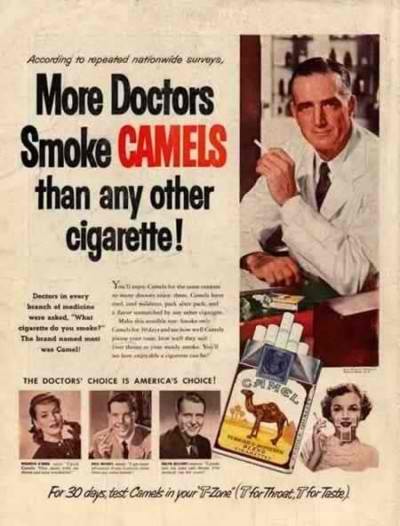 For example, look at the old cigarette advertisement at the beginning of this post. People used to think smoking was ok because the effects aren’t apparent in the here and now, but only at some future date and time. There’s no visible health issue after the first or tenth or one hundredth cigarette. In nearly every case, it happens very gradually, just as heavy-metal poisoning and hearing loss do. But science undeniably tells us that damage does, indeed, occur, whether we’re aware of it at the time or not. 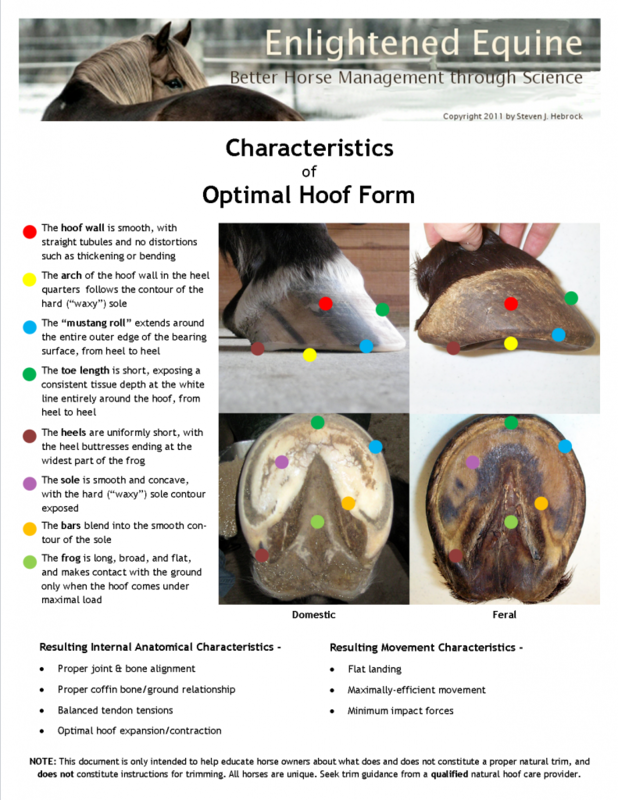 Again, I want to caution you that while many trim styles have some of these characteristics, only proper hoof care will result in all of these characteristics. So if you’re not seeing hooves that have 100% of these attributes, you’re either not seeing hooves that have been trimmed in accordance with natural hoof care practices for any length of time, and/or you’re seeing the consequences of other management problems such as environment or stress. Share the post "How Do You Know?"